On Saturday 6 April Defected heads to one of London’s newest warehouse venues for a hometown event for the label. 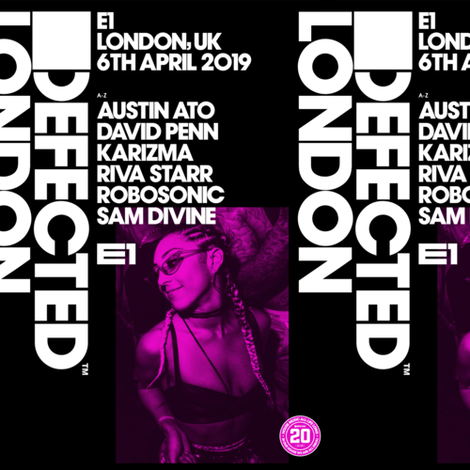 After recent sell out shows at Studio 338 and Printworks, the label brings a line-up to E1 that includes Karizma, Defected’s Sam Divine, Riva Starr, David Penn and Robosonic, as well as emerging DJ and producer Austin Ato. This smaller capacity event is an opportunity for Defected’s hometown followers to experience the label’s talent and production in closer quarters. Tickets for the party were initially opened up on pre-sale to Defected’s London followers, but are now on general release. With E1’s Funktion-One ‘Wall of Sound’ system and intimate vibe, expect a more underground style fitting of the warehouse venue. Defected is celebrating its 20th year throughout 2019 with an elevated string of bigger and better events, including the first ever Defected London FSTVL on 14 September. Under the slogan HOUSE MUSIC ALL LIFE LONG, the Defected events aim to represent everything there is to love about house music. The label’s values of ‘inclusivity, togetherness and escapism on the dancefloor’ set the tone for the global scene and combined with the Defected DJs, this debut event at E1 aims to be a memorable one.